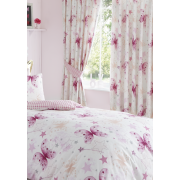 She will be very happy to go to bed with Make A Wish bedding range from Kids Club. These readymade curtains come fully lined and have a pencil pleat, matching tie backs come included. They will transform her window space.